May is right around the corner. 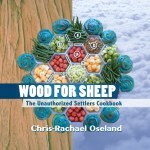 Soon, you’ll be able to buy Wood for Sheep: The Unauthorized Settlers Cookbook, and make all this glory for yourself. As you can see, this weekend, I invited people over to eat the bounty of my Southern Cuisine and Fish Dinner maps. 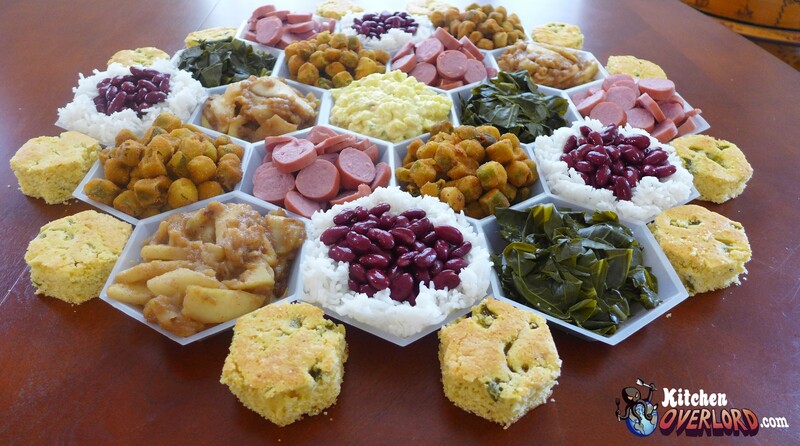 Above you see fields of fried apples, hills of red beans and rice, fried okra pastures, collard green forests, mountains of sausage rounds, and a potato salad desert. They’re all surrounded by jalapeno cornbread hexes, because cornbread is one of the best things about southern food. I really like this board. It’s time consuming (all southern food is), but you end up with equally good main courses for your meat eaters and your vegetarians as well as side dishes both can eat. Plus, I Iove any excuse to make fried apples. 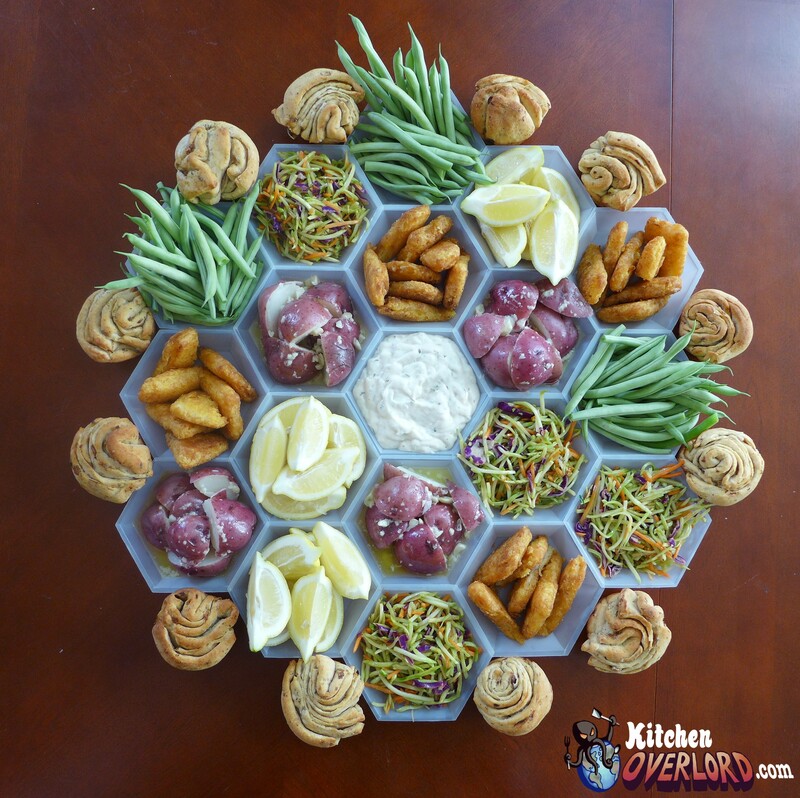 This Fish Dinner board came out so much prettier than anyone expected. Behold red skinned potato hills drenched in home made lemon garlic butter, mountains of fried fish alongside fields of lemon slices, pastures of broccoli slaw, forests of butter drenched green beans, and a desert of tartar sauce. I surrounded the whole thing with pull apart rolls stuffed with caramelized onions and roasted garlic cloves, but that’s just because I’m a horrible show off who loves baking bread. Plain biscuits or rolls would’ve worked just as well. I’m crazy for boardgames. 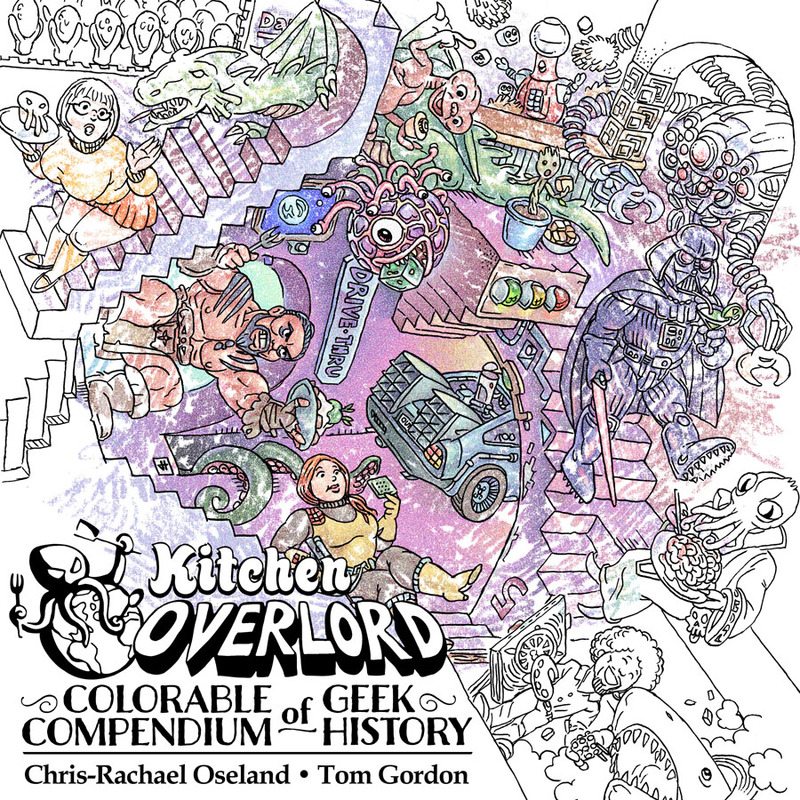 A few years ago, I managed to purge myself down to about 50, but the designers keep coming up with so many great new ones that my bookcases are once more bursting at the seams. I own some great games, but I can’t think of a single one that lends itself to a cosy dinner party as well as Settlers of Catan. Just look at those pictures. They make me love the game even more. 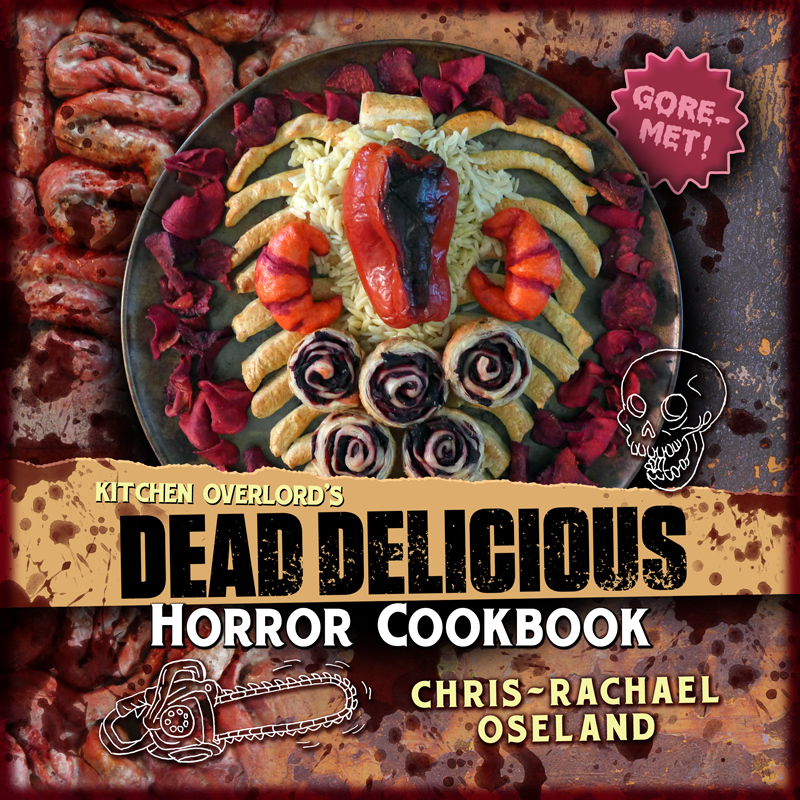 You can find recipes for all of the hextastic goodness in Wood for Sheep: The Unauthorized Settlers Cookbook.